· The transient student population is not a large problem that requires a whole new system for standards development. The actual percentage of students who move each year is between only 0.3-2%. · In addition, CC standards provide only a year end proficiency goal. If individual districts may determine their own curriculum, order and pacing, as the CC proponents claim, there is no inherent guarantee in the standards that a student moving mid-year will have received instruction in the exact portion of the standard as any another district. · Section 160.2000 of the Missouri Revised Statutes, Interstate Compact on Educational Opportunity for Military Children, already addresses barriers to educational success imposed on children of military families because of frequent moves and deployment of their parents. Common Core offers nothing new. · There are no pilot data to support this statement. This is merely a statement of intent, not a guaranteed, or even likely, result. · Members of the both the ELA and Math Validation Committees refused to sign off on the standards because this statement could not be substantiated with research or data. · CC was developed primarily by people affiliated with DC nonprofit Achieve, Inc., financed by large grants from the Bill and Melinda Gates Foundation and funds from the US Department of Education. · The standards development committee contained no high school English or mathematics teachers or English professors. It was made up primarily of test preparers, test providers and administrators. The two people credited with writing the grade-level English language arts standards (David Coleman and Susan Pimentel) have never taught in K-12 and have never published anything in K-12 curriculum and instruction. They have no credibility to the field. · The two people credited with writing the grade-level mathematics standards (Jason Zimba and William McCallum) have never taught in K-12, have never published anything on K-12 curriculum and instruction, and have no experience writing K-12 mathematics standards. No one in the field of education had ever heard of either of them. 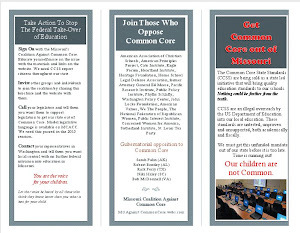 · Barbara Reys, who was a key opposition witness and who testified that CC standards were more rigorous than Missouri’s Show Me Math Standards, was the co-chair of a standards development committee which authored Missouri K-12 Mathematics Learning Goals. Reys is a mathematics educator, not a mathematician. A 2008 letter signed by more than two dozen Missouri University math professors was the result of their frustration with DESE’s math goals development process and the failure of Ms. Reys to incorporate their input. The goals she developed resulted in at least 1,000 students per semester entering Missouri University requiring remedial coursework in math. The letter cited constructivist math processes in the lower grades that is still rampant in the CC math standards. It would be a travesty for Missouri to continue to listen to mathematic standards advice from Ms. Reys. · CC is more likely to increase college remediation. CC chose to lower the standards and eliminate Algebra 2 content like geometric and arithmetic sequences, or combinations and permutations, from its own version of Algebra 2. Among students who just take Algebra 2, only 7% are ready and 22% are conditionally ready for college. · Remediation rates may drop only because colleges will be expected to alter their entrance requirements to eliminate the need for remediation, i.e. lower their requirements. DESE and the MDHE have worked together only to “ensure k-12 standards and entry level college standards are in alignment.” If everyone is taught the same standards but some colleges have higher admission requirements, who is more likely to have to change: the colleges who are out of alignment or the entire k-12 standards and assessment system? 3 Jacqueline E. King and Allison Jones, “The Common Core State Standards: Closing the School-College Gap,” Assessment Solutions Group, March/April 2012, available at http://www.smarterbalanced.org/wordpress/wp-content/uploads/2012/04/Closing-the-School-College-Gap-AGB-Trusteeship.pdf. · There is no graduation crisis. MO’s graduation rate is higher than the national average of 72% according to EdWeek. That number has been steadily climbing and is the highest it's been since the mid 1980s. · There is nothing in these unpiloted, untested standards that guarantees graduation. That is still up to the student and individual school. · A higher percentage of all racial and ethnic groups are graduating now than a decade ago. 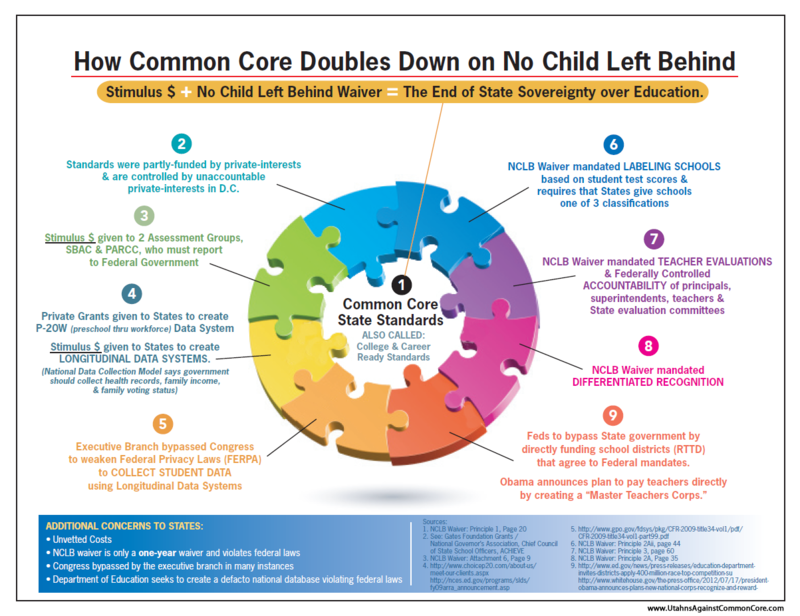 DESE Statement: “The CC standards were created through a state-led initiative” – See chart. · PTA support for the CC standards was paid for with a $1 million grant from the Gates Foundation which also helped fund the development of the standards. · The federal government gave federal stimulus money to Achieve and the NGA to write the standards. · The federal government pushed the states into adopting the standards through the Race To The Top Grant application and the No Child Left Behind Waiver. · Even CCSSI has backed off its original claim, that the standards are internationally benchmarked. The CCSI website now says the standards are “informed” by international standards. Dr. Sandra Stotsky testified that members of the CC Validation Committee tried for months – and failed- to get the drafters to identify the countries supposedly used for international benchmarking. 6 Byrd Charmichael, Sheila, Gabrielle Martino, Kathleen Porter-Magee, and W. Stephen Wilson. (2010). “The state of state standards—and the Common Core—in 2010.”Thomas B. Fordham Institute. In addition, the legislature provided funding for collaborative discussions/programming for teachers from around the state. Missouri test scores using a nationally normed test such as the NAEP indicated a steady increase of test scores each year. · Teachers readily admit that they are bombarded daily with offers for resources, lesson plans and curriculum. The only thing having a common set of national standards will do is make all those resources the same, not richer or more rigorous. · CC replaces the traditional foundations of Euclidean geometry with an experimental approach. This approach has never been successfully used in any sizable system; in fact, it failed even in the school for gifted and talented students in Moscow, where it was originally invented. Yet teachers are instructed not just to teach geometry but to teach it using this experimental method. · CC requires teachers to use a certain percentage of non-fictional texts in order to teach ELA skills. This is an arbitrary decision with no data to support it. In fact, even though all the historical and empirical data establish the superiority of literary study to “information text” study, teachers are instructed to follow the CC mandates. · The CC ELA standards in fact already dictate some instruction in other subjects. The ELA standards include “Literacy in History/Social Studies, Science, and Technical Subjects.” Through the device of improving “literacy,” the ELA standards inject content from other subject areas. · There is nothing in the NCLB waiver that precludes other subjects from being implemented. · When the opposition claims that MO teachers, professors and parents were involved in the standards development it means a small number of teachers were given the opportunity to review a confidential draft . They did not have a seat at the drafting table and nor did Achieve Inc. have any obligation to either accept or even explain why they did or did not make changes based on comments. · While the standards themselves do not dictate that states use a particular assessment, Missouri has signed a contract with the Smarter Balanced Assessment Consortia (SBAC) to develop assessments aligned with CC. We therefore are not currently developing our own assessments. We have only one vote in twenty six on those approving those tests in which items are prepared by Pearson, a significant funder of the standards’ development. · Also, performance items must be reviewed subjectively by individuals which allows for bias (corruption and manipulation) in the evaluation of performance data. Missouri will have little if any influence in controlling for this error source once the SBAC assessments become the state’s assessment plan. 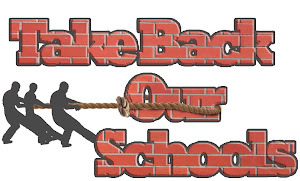 · The commitment to using SBAC assessments amounts to an unfunded mandate to the local school districts. The costs to acquire and maintain the technology necessary to administer these tests will be born solely by the school district. The Foundation Formula will not fund it. · Missouri Statute 160.526 states, “Within six months prior to implementation of the statewide assessment system, the commissioner of education shall inform the president pro tempore of the senate and the speaker of the house about the procedures to implement the assessment system, including a report related to the reliability and validity of the assessment instruments, and the general assembly may, within the next sixty legislative days, veto such implementation by concurrent resolution adopted by majority vote of both the senate and the house of representatives.” This action has not been taken. The Common Core standards are copyrighted to private organizations to control content based on the values, beliefs and political positions of the copyright holders. The determination of acceptable performance on the assessments is based on the content of the copyrighted material. The long term decisions for the student’s career and college readiness thus are made by people who reinforce the values, beliefs and political positions of the copyright holders, not of Missouri. These computerized assessments are critical to the larger plan to collect student identifiable data which will be sent to the US Department of Education and from there distributed to other governmental agencies thanks to changes made by the US Department of Education to the Family Education Rights Privacy Act. These changes, made by a regulator to a Congressional Act, were made after states were directed to collect this data in a certain format. DESE has admitted to collecting 61 out of the full 418 data points included on the national data quality campaign set. Was the legislature aware that this data was being collected and shared? What process is in place to make public when other data points become activated in the future? DESE does have statutory authority to develop state standards for education. However, the statute does not grant them total autonomy over this process. Section 160.526 states, ". . . in establishing the academic standards and statewide assessment system, the state board of education shall adopt the work that has been done by consortia of other states and, subject to appropriations, may contract with such consortia to implement the provisions of sections 160.514 and 160.518.". They have made no presentations or requests to the budget or appropriations committees for funding implementation of Common Core or the assessments. DESE has been aware for many years that Massachusetts has scored number one on the NAEP test to which our own MAP tests were benchmarked. There are ten years worth of scoring data to demonstrate that MA standards produced high student performance on the NAEP. Massachusetts makes their standards available for free to any state who would like to consider incorporating them into their own standards. Likewise, Indiana who has nationally recognized standards, has made their standards available to other states to share. In the last decade, with data available to demonstrate their effectiveness, DESE did not consider adopting the MA, IN or CA standards. A note about Massachusetts’ adoption of Common Core standards: Their adoption by MA should not be considered an endorsement of the quality of the standards. CC were adopted by MA in 2010 before the standards had been seen or approved by the validation committee. Initially the MA Department of Elementary and Secondary Education tried to get out of adopting CC, but with $250 million, a lot of political pressure and a governor, Patrick Duvall, who is on the board of Achieve Inc., they had little choice but to go along. The proponents of CC knew that if they could get MA to adopt, the other states would fall in line. Thank you! The time and effort you put into this article is deeply appreciated by many, I'm sure! I applaud your thoroughness and in-depth information on the disputed DESE's 'answers' to everyone's questions. This present Progressive president and Democrat Progressives will do all in their power to control our chidrens' minds, and eventually their way of life. We must stop the propoganda in our schools if we want a humane future for them. I just wanted to personally 'Thank you' for your dedication and work put into this. It is already being implemented. I have a response from the Fort Zumwalt School District Superintendent (O'Fallon Missouri) Dr. Bernard J. Dupray which states "the Fort Zumwalt School District has been incorporating the standards into our curriculums as they have been rewritten since 2010". So now what do we do?